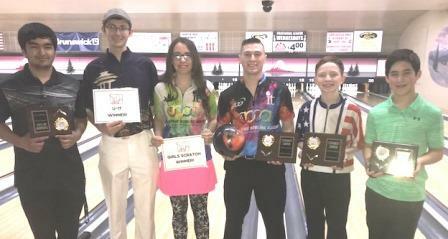 Tommie McNeal and Colt Jance struck their way to JBT titles in exciting Pacific Northwest Conference action at Everett's Evergreen Lanes. Jacob Frazier began the scratch division stepladder finals with a 224-206 win over Andrew Martin. Makana Wong then put together ten strikes for a 273-186 win over Frazier to move on to the title game. Top seed McNeal had a considerable lead on the field, and he had no trouble in the finale either, defeating a snakebit Wong 213-176, to earn the ninth title of his JBT career. Aubrey Harding blasted a big game to win round one of the handicap stepladder 268-177 over first time finalist Skyler Broussard. Jance then stopped Harding 246-207 to move on to the title game. Top seed Jaadyn Humphries had been brilliant all day, with three scratch games over 260, but Jance wasn't far behind, and when Jaadyn struggled in the final, Jance continued to look strong. The 222-147 final score was good for the 3rd title of Colt's career. In all, he cleaned up for over $400 in scholarships this weekend alone. John Malone swept the U17 weekend with a 182-180 squeaker over Bud Sicard. Brooklyn Biudreau won the day's Priority Girls Scratch event with a 183-150 win over Madison Flatin. Big thanks to the team at Evergreen for another great hosting job. Want in on all this fun for everyone? Just check out our schedule and come on down!